China (Again) Shoots for the Moon. We Should Join Them. 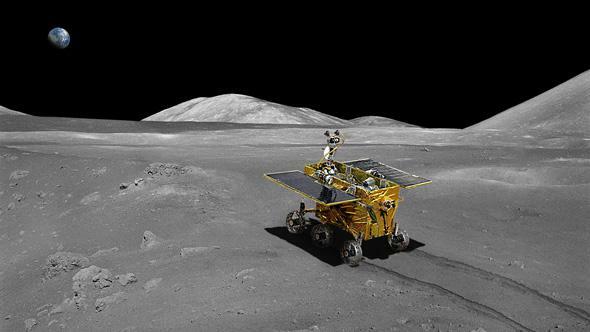 In two weeks, China will have a rover on the Moon. Click to embiggen. Over the weekend, the Chinese government did something that has not been attempted in nearly 40 years: Launch a spacecraft for a soft landing to the Moon. On Dec. 1, 2013, the Chang’e 3 lander and rover launched successfully from the Xichang Satellite Launch Center in Sichuan, China. It’s on a direct orbital insertion path, meaning it heads straight from Earth to the Moon (sometimes, long, looping paths are taken to utilize Earth’s gravity for maneuvers to save fuel). 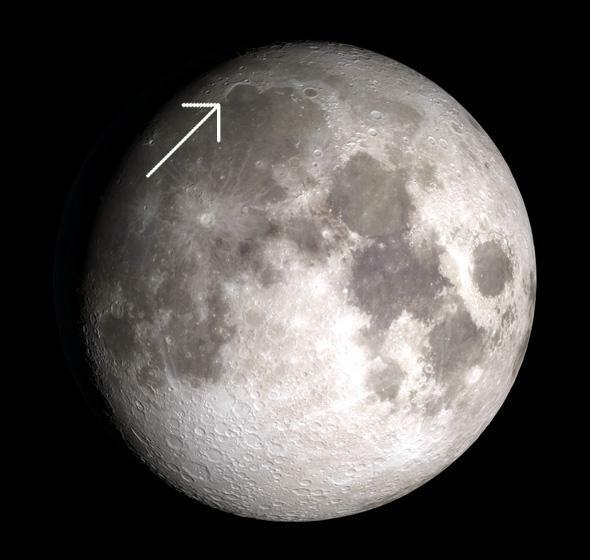 It should enter lunar orbit on Dec. 6, orbit for a week, then land in an area called Sinus Iridum (“Bay of Rainbows”) on Dec. 14. I have some thoughts on this, but first, there’s a launch video that — as is usually the case with launch videos — is very, very cool. Launch occurs one minute into the video (although I have to say, a few seconds earlier when they cut to the shot of the bottom of the rocket, with the small fins and engines bells sticking out, I had a momentary flashback to watching Gerry Anderson supermarionation TV shows as a kid). Other key moments are at 1:29, when they cut to the external rocketcam, 3:19 when the external boosters cut out and fall away, 3:33 when the second stage ignites after the first falls away, and 6:38 when the third stage booster ignites and the second stage falls away. The rocket used was the biggest and heaviest of China’s Long March boosters, powerful enough to fling the 1200 kilogram (2600 pound) rover and lander to the Moon. Once they land, the rover will deploy and wander the surface to make scientific measurements. The instruments include the usual sorts of things for a rover: cameras, surface probes, mineralogical testing devices, and a far-ultraviolet telescope; UV light is absorbed by Earth’s atmosphere, so the airless Moon is a good platform for such an astronomical device. The mission has a three month nominal lifespan, and is a testbed for future and more ambitious rovers. You can read more about all this at Emily Lakdawalla’s blog at The Planetary Society. Sunrise at Sinus Iridum, an impact basin in the Moon’s northern latitudes. This simulated image shows the Moon as it will appear on Dec. 14, 2013, when Chang’e 3 lands in Sinus Iridum. First, China has been launching rockets since 1970, and has done quite a bit of space exploration. It seems like a straightforward enough assumption that they will continue to aim for the Moon — they’ve launched two orbiters, Chang’e 1 and 2, already — with an eye toward eventual crewed mission. They’ve already been building space stations in low Earth orbit (the Tiangong space station in the movie “Gravity”? Yeah that’s real), and have invested a lot of cash into space; they have four main launch sites and are clearly serious about this next step in human exploration. I’ve written my thoughts about this a few times in the past, usually when China makes progress, or when NASA’s future is threatened yet again by Congress, the White House, or its own Administration. The bottom line is this: I want humans to live in and explore space. If those humans are Chinese, or Russians, or what-have-you, then I’m glad, because it significantly improves the long-term survival chances of our species. But I’m an American, and there’s some amount of pride in me. This country has always been a leader in pushing back the boundaries of space, and inspiration is no small part of that. I want to see my own nation continuing that pioneering spirit, but instead I see it all-too-commonly mired in bureaucracy and politics, and stunted by a lack of vision. I am not interested in another space race. This needs to be articulated clearly: Such things tend to be all flash and no substance. In the 1960s it led to many Soviet and American disasters, and to a too-well-defined and specific goal: Landing humans on the Moon. Once those footprints were there, we turned on backs on the Universe, or at least the human exploration of it. A race has a finish line, and once you cross that line, you’re done. That is precisely the opposite philosophy we should have right now. Exploring space is a long-term goal, one with many paths, many achievements along the way, and not one shining endpoint where, once we get there, we can rest. What I hope to see from this latest Chinese effort is a rekindled sense of desire in America, a strong sense that once again we should be leaders in this grandest of all adventures. We need to achieve a balance between good-natured national competition and cooperation, so that all humans can benefit as we reach for the sky. And the benefits are many. My congratulations to the people of China as they strive for the Moon. I hope that in a few years, there will be many others of us joining them.